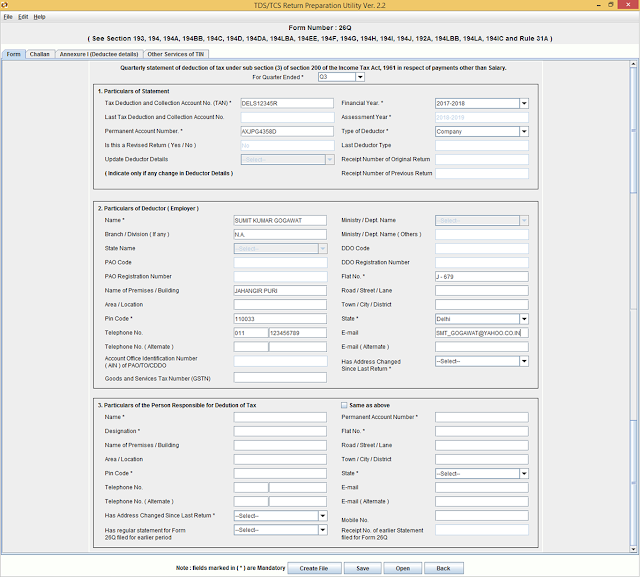 Home / Income Tax / Tax Deducted at Source / How to File TDS Return without any software? How to File TDS Return without any software? Friends, We have lots of query on our whatsapp group for filing of TDS Return without any software. So today we discuss about how to file TDS Return without any software. However, software we use to file TDS return and discuss in this post is Java Utility, which is free available on TIN-NSDL Website. Click Here to Download this free utility. To use this utility you must have installed latest Java in your computer/ laptop, because this utility is Java based. Select Return type Regular or Correction. Regular option is use for filing of regular quarterly return and Correction option is use for filing of Revise Return/ Correction. Click on Continue. Now system ask you to enter Company/ Firm/ Proprietorship details on next screen. Now click on Annexure I (Deductee details) on page navigation. Click on Insert a Row, this will ask you to enter the total no. of deductee in each challan. Suppose we enter only 1 no challan in our return then system ask you to enter deductee record related to Challan no. 1. System automatically generate 2 nos. rows in the Return form. 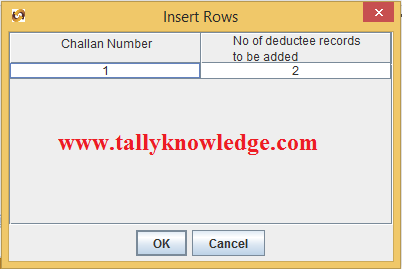 Rows added to enter deductee record. Fill all the details like Section, PAN, Name of deductee, date of payment, Amount paid, TDS deducted, date of deduction etc. Note: Challan total is to be match with Total TDS deducted in Annexure I (Deductee details). Now click on Create File, TDS File validation utility will be appear on your screen. Click on Validate and System generate FVU Files, copy fvu files in pen drive and file to any TDS Center or upload FVU file direct in your TDS Account on Income tax website.